MOUNTAIN VIEW, Calif. (KGO) -- A cop with the Mountain View Police Department pulled over a car for driving too slow on El Camino Real on Thursday. The vehicle was traveling at 24 mph in a 35 mph zone. 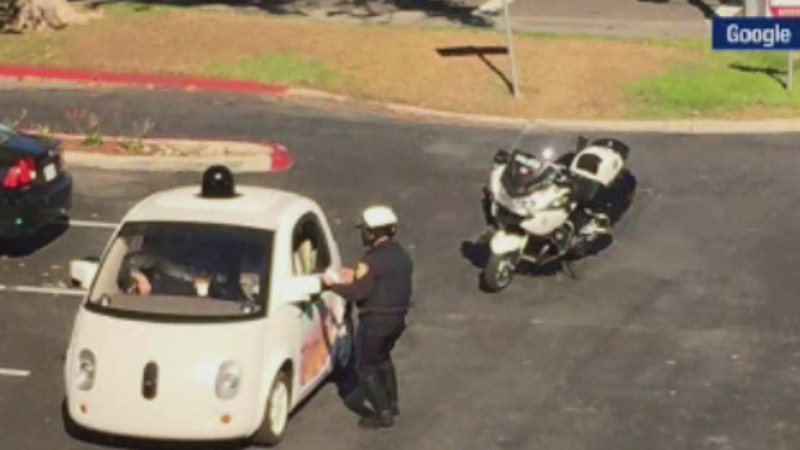 But as the officer approached the car, he realized it was a self-driving Google car. The cars are allowed to be operated on California roads with speed limits at or under 35 miles per hour. As a result, no ticket was issued because no law was broken. But the situation is raising questions around the issue of who would get the ticket in the case of a valid traffic violation? The passenger? Or the Car? The Google Self-Driving Car Project put up a social post on the topic. All over Silicon Valley, companies are working on self-driving or autonomous vehicles, but Google has been one of the first, starting six years ago. Four states allow testing of self-driving vehicles on public streets and highways. The goal is to let technology take over the driving in a bid to improve safety and reduce injuries.